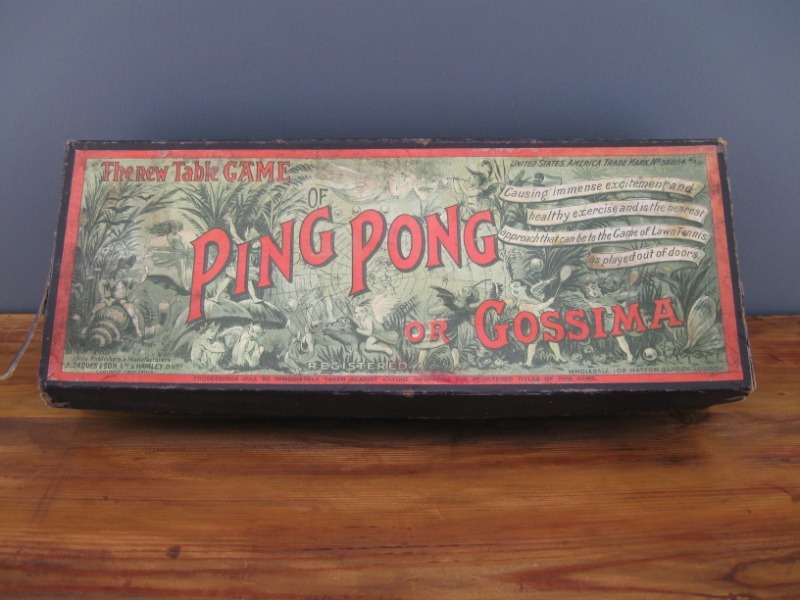 Early Ping Pong Gossima table tennis set from J Jaques & Son and Hamley Bros in original box. 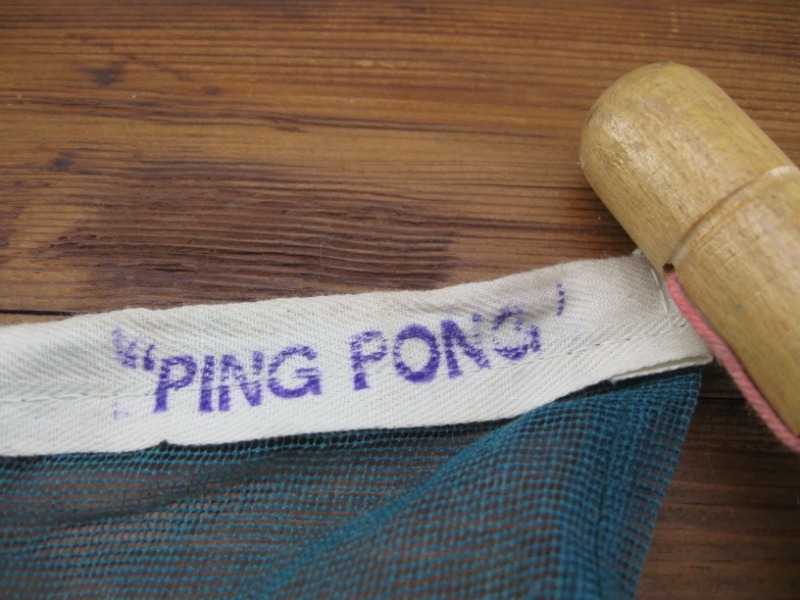 Includes, two vellum ping pong paddles, two net supports (wood and brass) and one net (material & string) all branded ping pong. 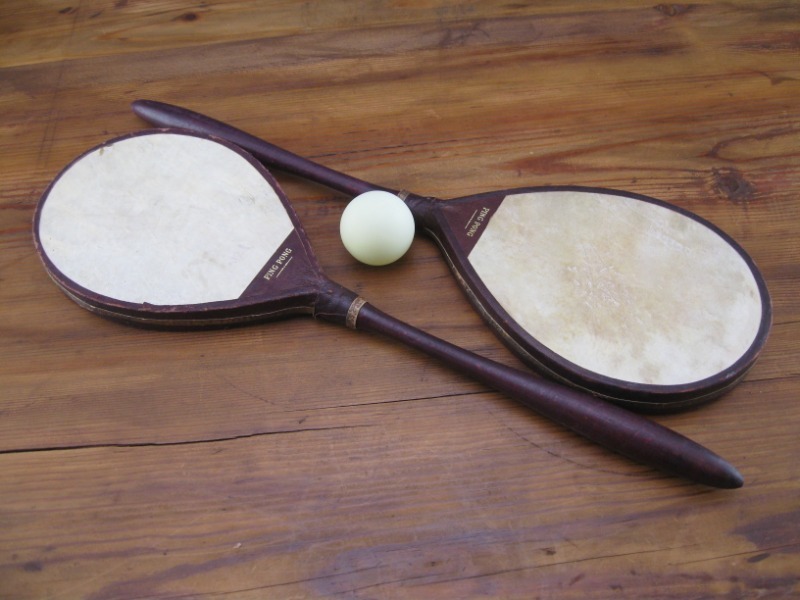 The paddles are made from vellum stretched over the frame on both sides like a little drum - which is why they much such a great sound when hitting the ball. 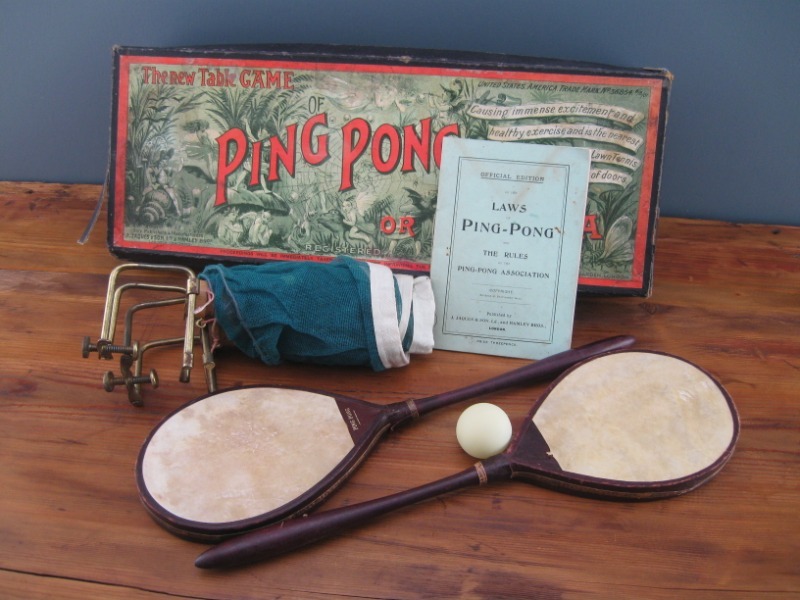 Although celluloid balls were invented in 1901/1902, the ping pong ball included in this set is probably of a slightly later period (around mid 20th century). 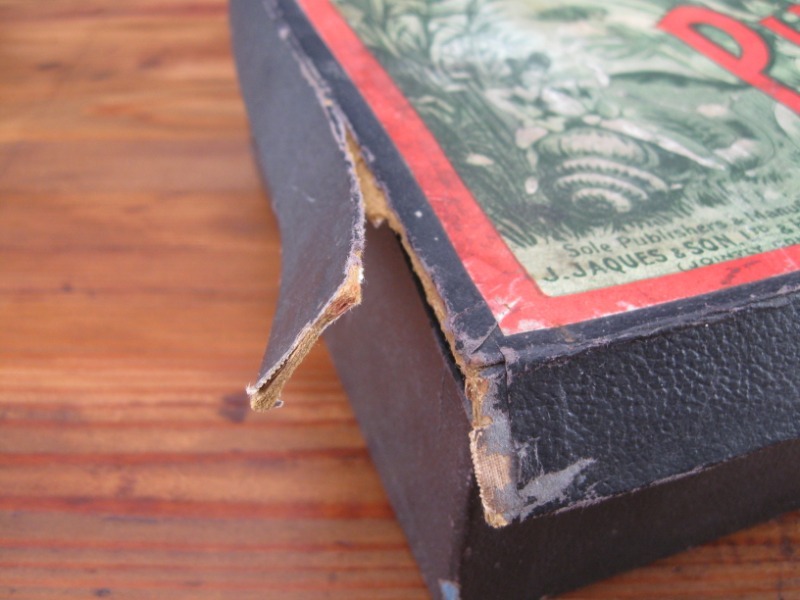 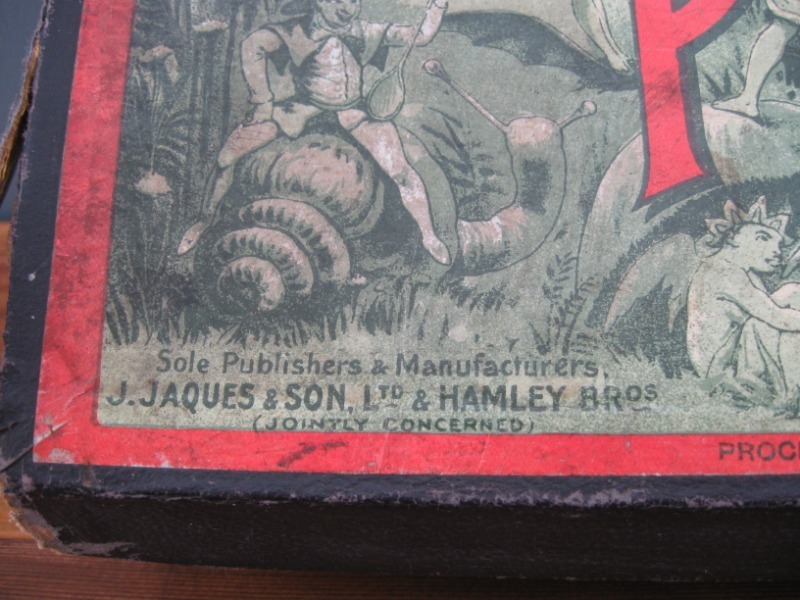 The contents of the set are in good condition for their age but the box lid does have some damage to one corner/side. 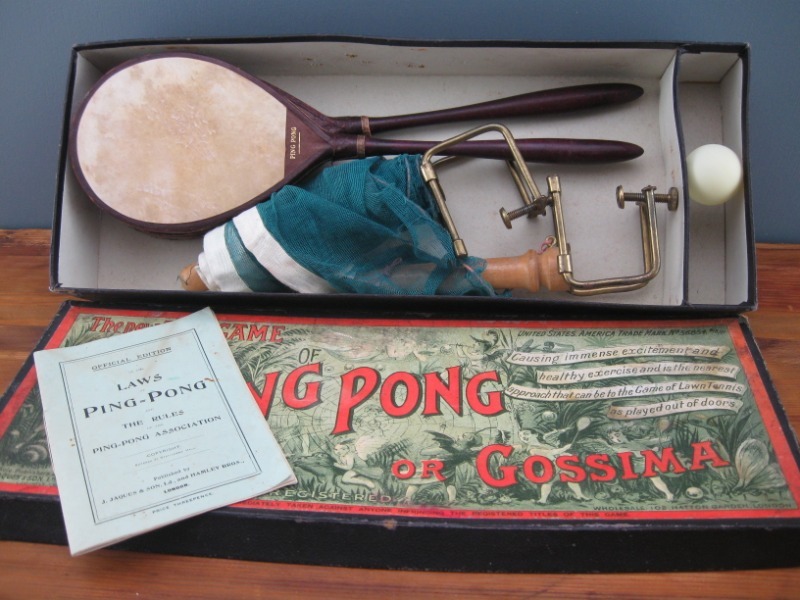 The sport originated in Victorian England, where it was played among the upper-class as an after-dinner parlour game. 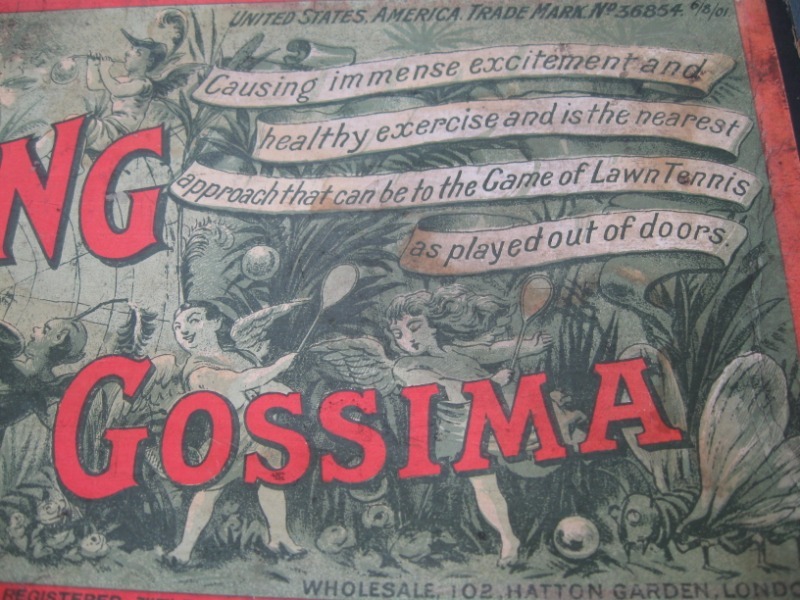 It has been suggested that makeshift versions of the game were developed by British military officers in India in around 1860s or 1870s, who brought it back with them. 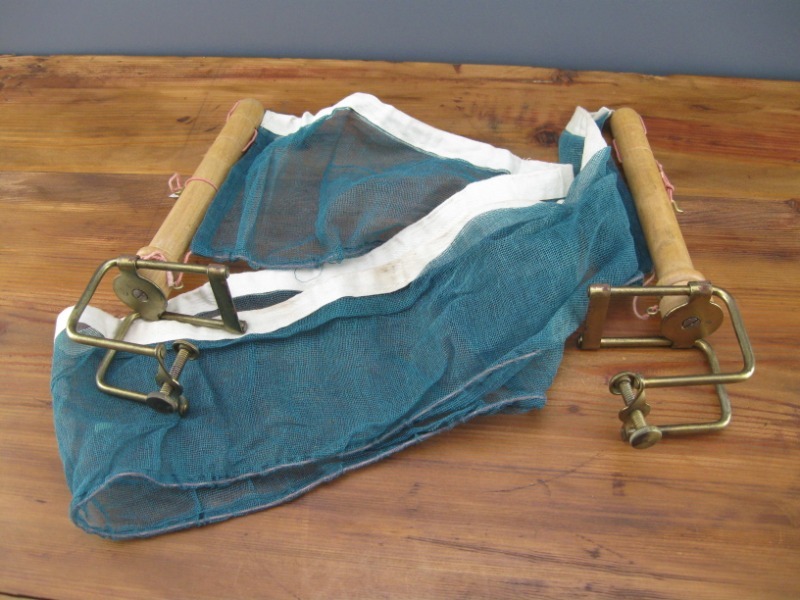 A row of books stood up along the center of the table as a net, two more books served as rackets and were used to continuously hit a golf-ball (or champagne cork). 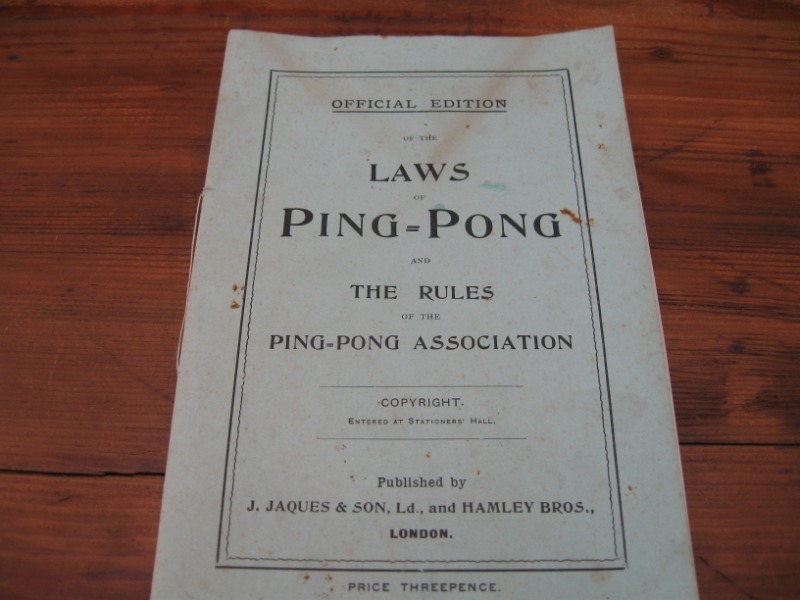 The name "ping-pong" was in wide use before British manufacturer J. Jaques & Son Ltd trademarked it in 1901. 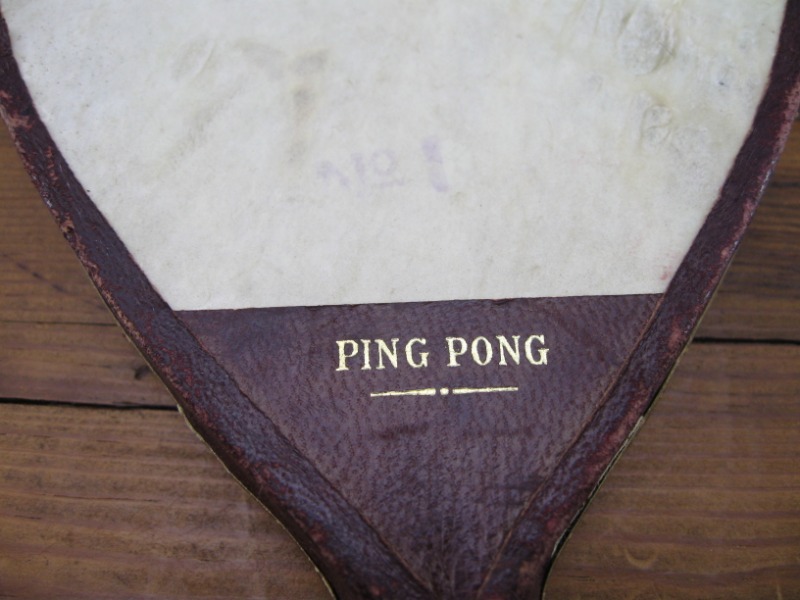 The name "ping-pong" then came to describe the game played using the rather expensive Jaques‘s equipment, with other manufacturers calling it table tennis. 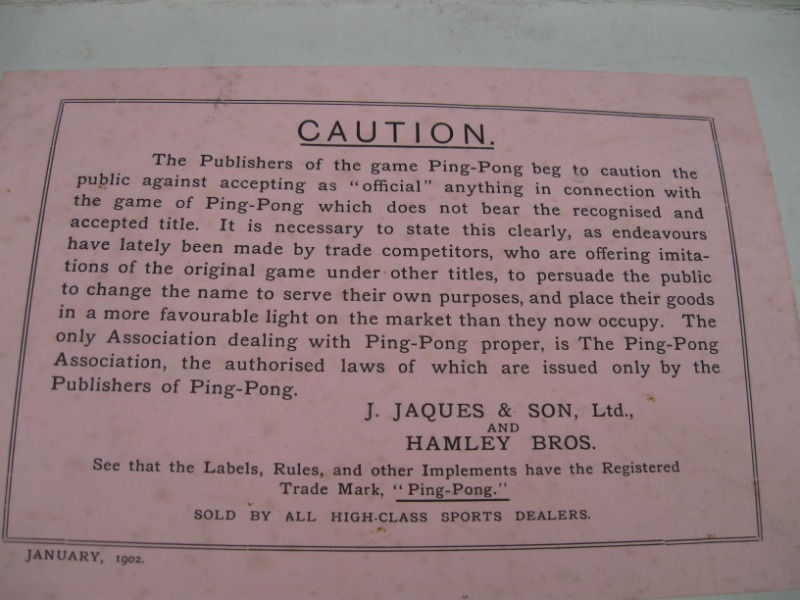 A similar situation arose in the United States, where Jaques sold the rights to the "ping-pong" name to Parker Brothers. 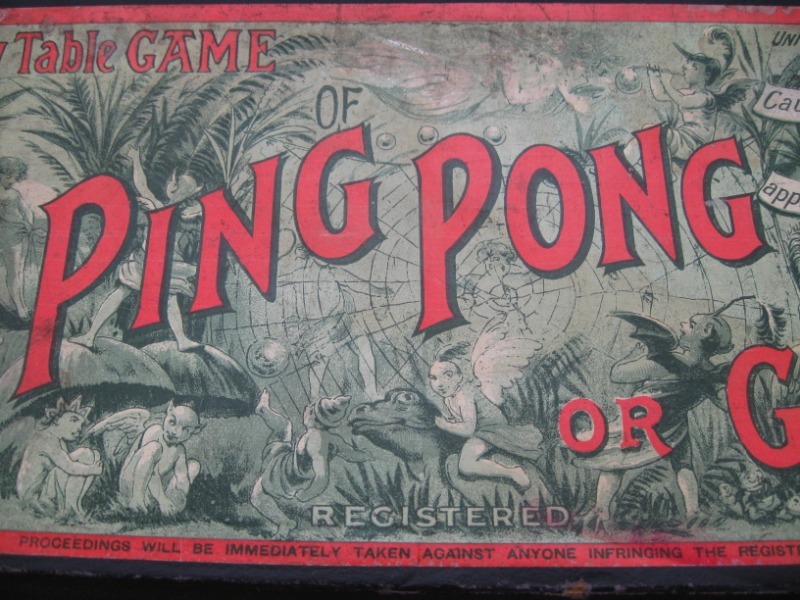 Parker Brothers then enforced its trademark for the term in the 1920s making the various associations change their names to "table tennis" instead of the more common, but trademarked, term.